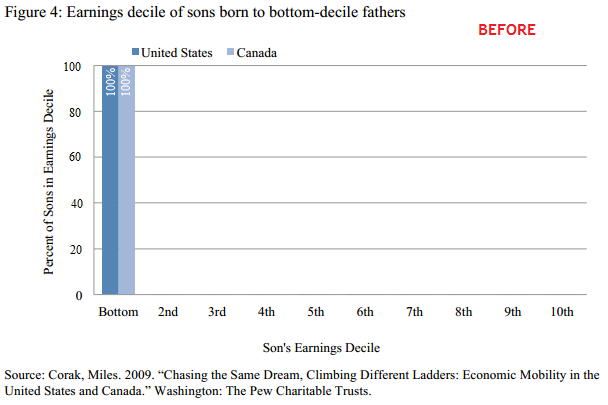 This quiz asked us to predict how sons born to fathers in the lowest-earning 10% would fare when they became adults (in the United States and Canada). How many would still be in the bottom 10%? How many would advance into higher-income brackets? 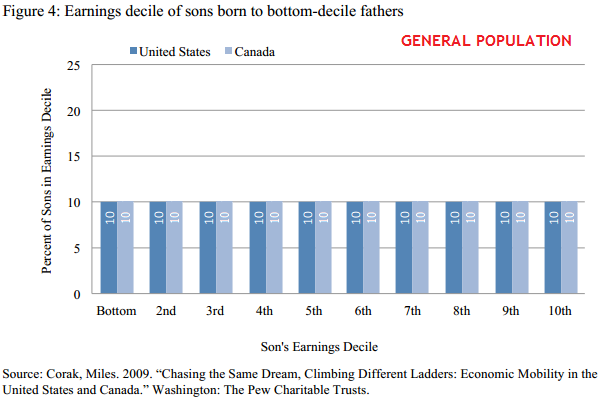 To visualize the starting point, we used this chart showing all of the sons in the bottom 10% while they are children. What outcome would we like to see? Probably the most optimistic expectation would be that the father's income has absolutely no influence over the son's income. If that were the case, the sons would be uniformly distributed across the income spectrum, mirroring the general population. That is clearly unrealistic. North American society may be this blind to blood type or shoe size, but the disadvantages of growing up with a poor father will not be so easily overcome. So how do the sons really do? Here is the chart as it appeared in the source paper as Figure 4. About 80% of the sons have escaped the bottom bracket. About a third of the sons have moved into the top half of earners. Seven percent have made it all the way to the top bracket, not so very different from the ten percent we would expect if they were born to O Positive fathers from all income levels instead of poor fathers. 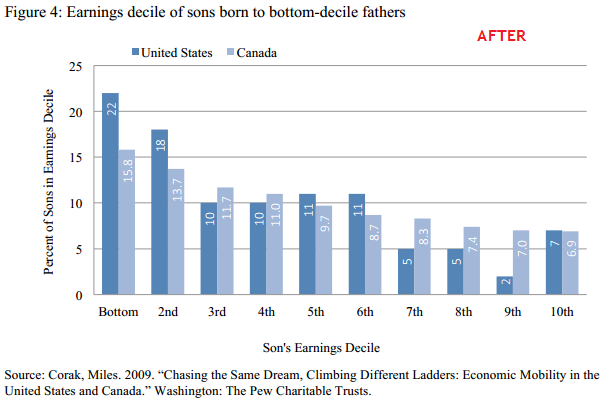 A necessary consequence of this appears in Figure 3, which shows the outcomes for sons born to fathers in the top 10% by earnings. Three quarters of them have dropped out of the top bracket; about a third have fallen into the bottom half. Many people move through brackets over a lifetime; many high-earning adults started out just scraping by. Not everyone tastes poverty, not everyone enjoys wealth, but there is a lot of churn and we should remember that a "median net worth household" is an abstraction that does not represent real individuals over time. flagamuffin scores a point for a precise and fairly accurate guess. He made a good observation about how immigration might push low-income sons up a bracket or two without boosting their incomes, but may have overestimated how effective this force would be. His expectation of 30% promotion into the top half was spot on, though he was too pessimistic about the possibility of catipulting from the bottom straight to the top. though he was too pessimistic about the possibility of catipulting from the bottom straight to the top. Not sure how I missed the first post. Must have been a busy day that day. All of these analyses are difficult, because there are so many variables to control for in any one comparison (e.g. race, parents' education, mother's income). As I pointed out in the original thread, the controls in the news article were bad enough that the data aren't incredibly useful. We need to remember also that the very idea of a decile itself isn't very useful, either, if we aren't comparing cross-era data sets. That is, the third decile might be a much lower wage in 2009 in real dollars than the third decile in 1979 (about the time when real wages for low skill jobs started contracting). Any way you look at it, however, I'm encouraged by the numbers. It's not what I expected. Did you happen to see this? I think that reforming the way taxes are collected might further encourage even more mobility. As I pointed out in the original thread, the controls in the news article were bad enough that the data aren't incredibly useful. Your disappointment in the article's rigor was not very evident at first. In the this whole "land of opportunity" thing is bunk dialog you seemed to endorse the premise of "white privilege," giving yourself as an example of someone who "did technically graduate high school, but barely" and yet ended up affluent. The big idea of the article is that good life choices, especially relating to education, do not matter. What matters is whether you are born to a rich or poor family. I did not question the data provided. In my view the data provide evidence that education is the most important factor in having a better future, and birth status is not a good predictor of future outcomes, completely contrary to the article. If we want to know which factor is more important, birth status or education, we won't learn anything by looking at the latter two groups. I think we can speculate that poor dropouts have bad outcomes, and rich graduates have good outcomes, without stretching credulity nor contradicting my conclusion about education being the best single predictor of outcomes, based on the data given. The two subgroups considered are the ones we must examine to determine if birth status or education make more of a difference. It is particularly odd that you cite your personal story, since you (born to a "middle class white family" and having completed an advanced degree that you neglected to mention) belong to one of the subgroups that leaves the cause and effect relationship unclear. Why do you believe it was "white privilege" and not your doctorate that enabled you to become an art collector? I think my current circumstance is a combination of hard work, good choices, and luck. You did not mention good looks. We have a question: Is education associated with improved life outcomes? Somebody gathers data and finds that people with more education tend to have better outcomes than people with less education. That is evidence that helps us answer the question. It does not tell the whole story. Perhaps being tall helps too. (Seriously.) We assume that there are both tall and short people in both the dropout and graduate groups, so any height effect will cancel out. This might be a bad assumption, and we would have to ask another question and gather more evidence to find out. We will never determine all the ingredients that contribute to each success; that would require a biography of every individual. But that doesn't mean we can't make justified generalizable conclusions with some level of confidence.